Properties in Wellington CBD average 4.3 out of 5 stars. ★ Family/Friends Getaway ★ Walk everywhere ★ Secure ★ BOOK NOW!!! Property 3: ★ Family/Friends Getaway ★ Walk everywhere ★ Secure ★ BOOK NOW!!! Large, modern, stylish, house with garage, and central central central! Property 18: Large, modern, stylish, house with garage, and central central central! Prime City Location. Loft Apartment. Close to Cuba St.
Property 21: Prime City Location. Loft Apartment. 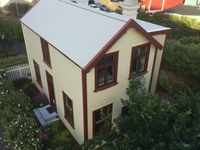 Close to Cuba St.
Smart and tidy cottage close to CBD. Property 22: Smart and tidy cottage close to CBD. Just add theatre tickets and enjoy! Property 33: Just add theatre tickets and enjoy! A fantastic location. So close to everything and a lovely place to stay. Thoroughly enjoyed our time. Great outlook, handy to supermarkets and restaurants and to the water front - Te Papa right over the road. 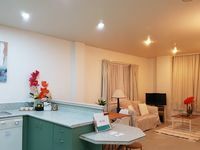 Well appointed apartment - clean and comfortable.